Ms. Iliyana Tsanova is Deputy Managing Director of the European Fund for Strategic Investment (EFSI or the Junker plan) – a EUR 16 billion guarantee facility, launched jointly by the European Commission and the European Investment Bank Group to restore growth and support strategic investments in the European Union. 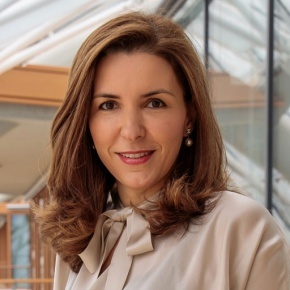 Before joining EFSI, Ms Tsanova held various senior banking positions with the European Bank for Reconstruction and Development (EBRD) Infrastructure team in London, UK. Ms. Tsanova has also held non-executive board positions in international utility companies and investment funds for infrastructure investments. In 2013 and 2014, Ms. Tsanova was appointed Deputy Prime Minister and Minister in charge of the management of the European Structural and Investments Funds in two separate caretaker governments of Bulgaria. Ms. Tsanova’s academic background is in Corporate and Business Finance. She holds a MSc. in Finance from University for National and World Economy – Sofia, Bulgaria, and a postgraduate studies in Financial Management as а visiting scholar at Georgetown University – Washington DC, USA. Designated Young Global Leader by the World Economic Forum in 2015.